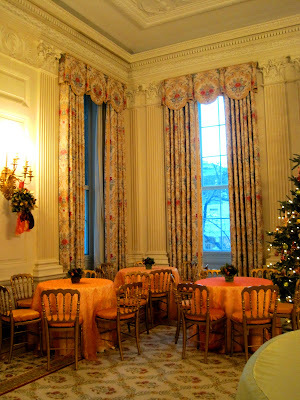 The China room on the ground floor is now also referred to as the Dining Room. 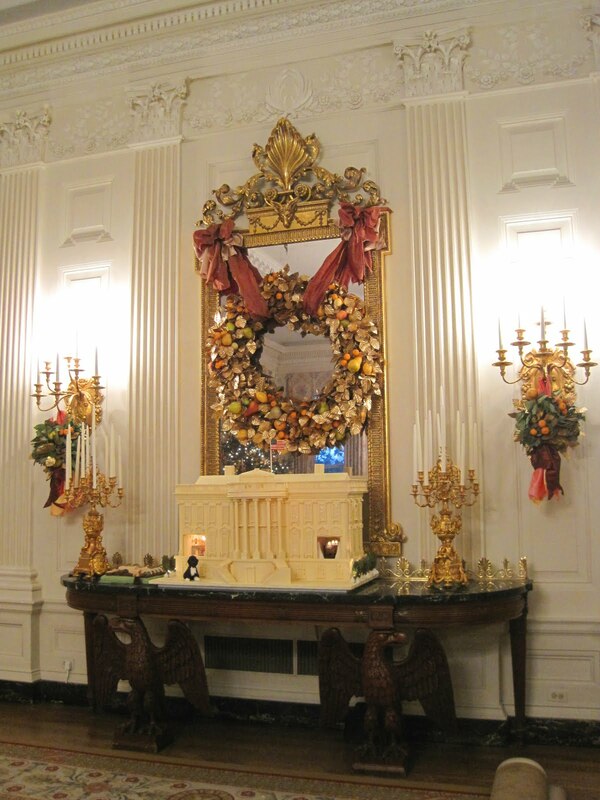 Architects McKim, Meade & White had designated the room a cloak room in the 1902 renovation, but in 1917, Mrs. Woodrow Wilson requisitioned the room to display the growing collection of presidential china. The room has a red color scheme based on the elegant 1924 portrait of Mrs. Calvin Coolidge, Grace. 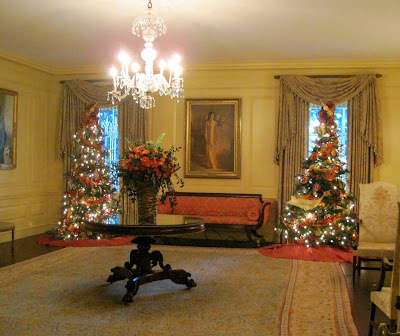 The shelves that display the china are red velvet, the curtains are red silk taffeta and the room is finished off with an early 20th-century Indo-Ispahan rug. 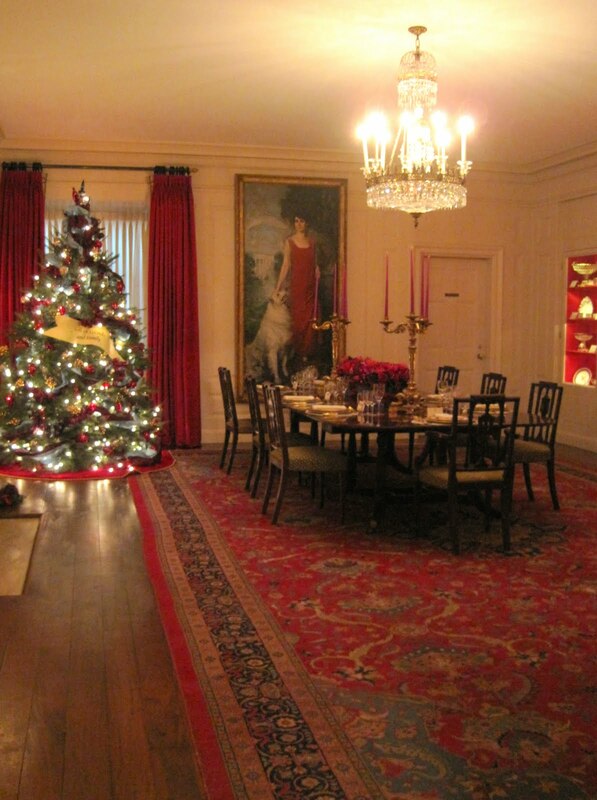 The room has more of the salvaged wood paneling, which was again, painted under the Boudin redecoration. 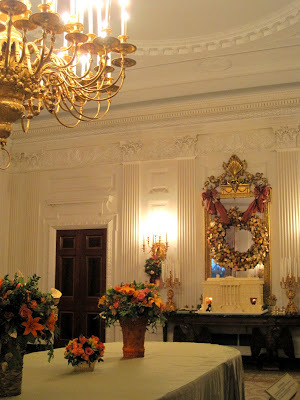 I love the regency style chandelier! Before paneling, the room had smaller built-in cupboards which you can see below in 1948. 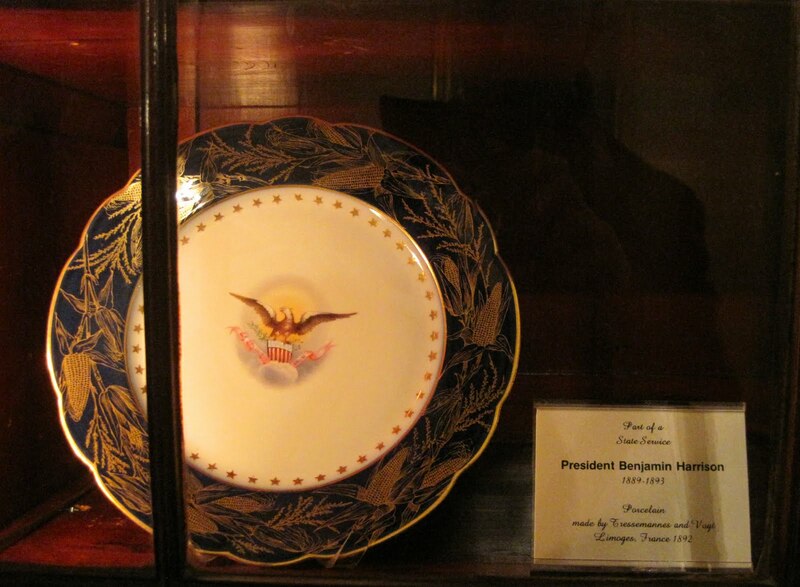 I guess thats fitting as there was less china at the time! The cupboards were created more shallow however, after the paneling, and a few of the larger items could not be included. I call that a major oops! 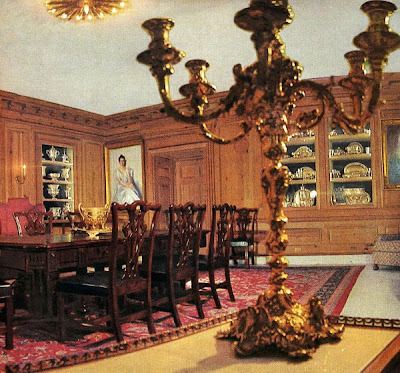 This image below shows the Boudin Kennedy-era redecoration. The paneling was glazed grey with white details. 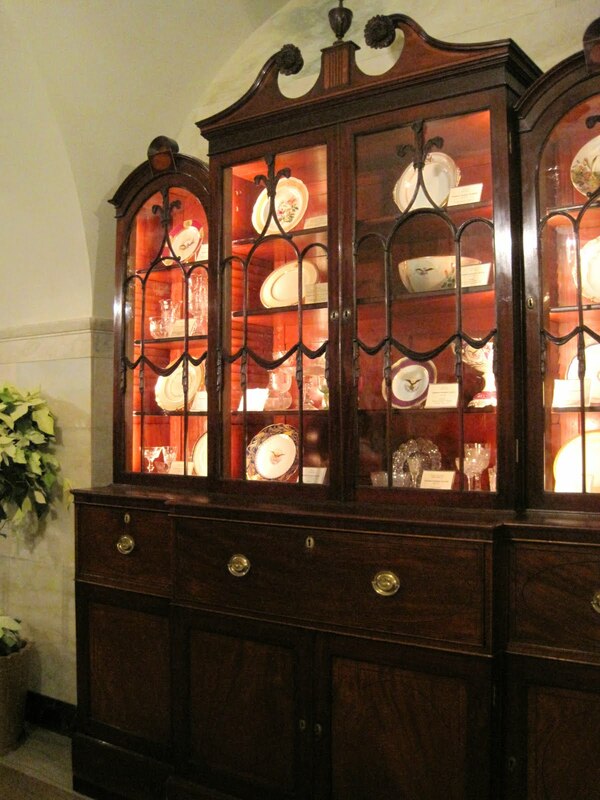 As the collection continues to grow, parts of it are housed in the corridor in pieces of furniture. I loved the china of President Harrison, with the edge band of navy blue with raised gilt stalks of corn! 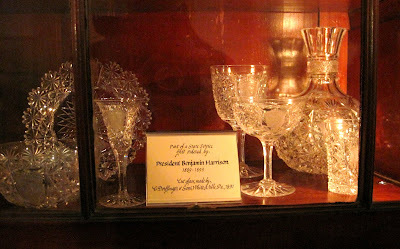 Included in the same case was President's Harrison elegant cut crystal. 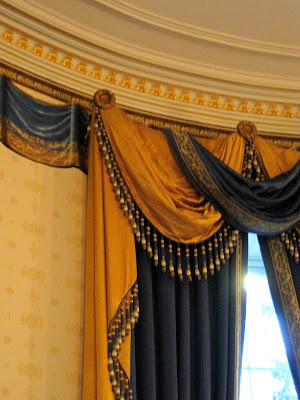 When visiting the White House, unless you are on official state business, you will enter from the ground floor (yes, I've shown these posts in reverse order of my visit!). Located on this floor are a number of functioning spaces so much of it is closed to the public. However, one can catch glimpses of the Library, seen above. 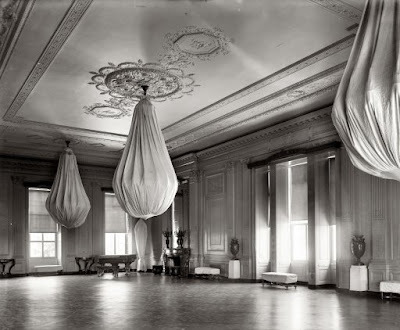 Before the 1902 renovation of the white house, this was the official laundry room of the building until becoming the servant's locker room. In 1935 it was turned into a library. 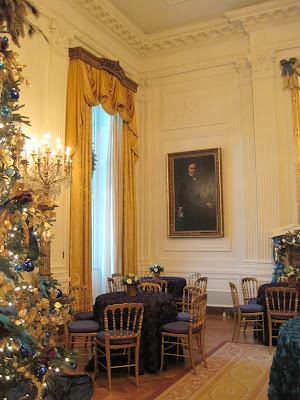 The space is used for small meetings as well as press conferences and houses over 2700 books on American life which are added to by each president. 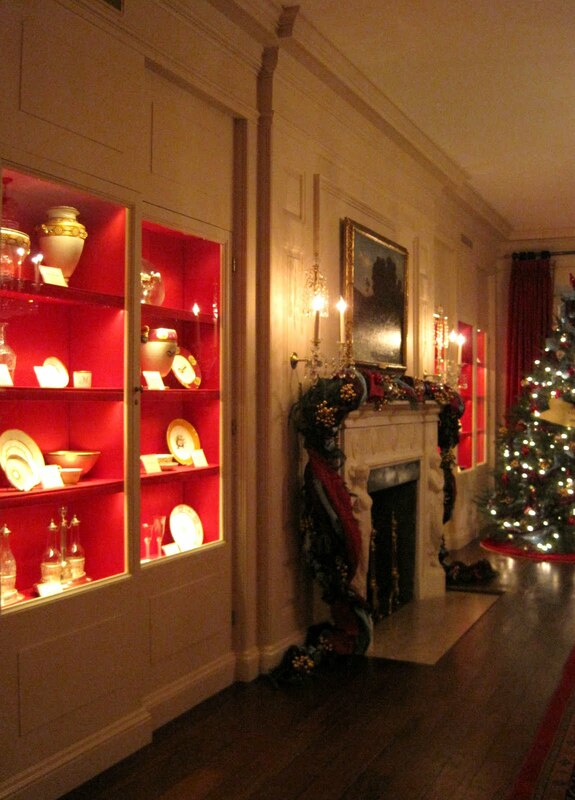 The current furnishings are from New York, circa 1810. 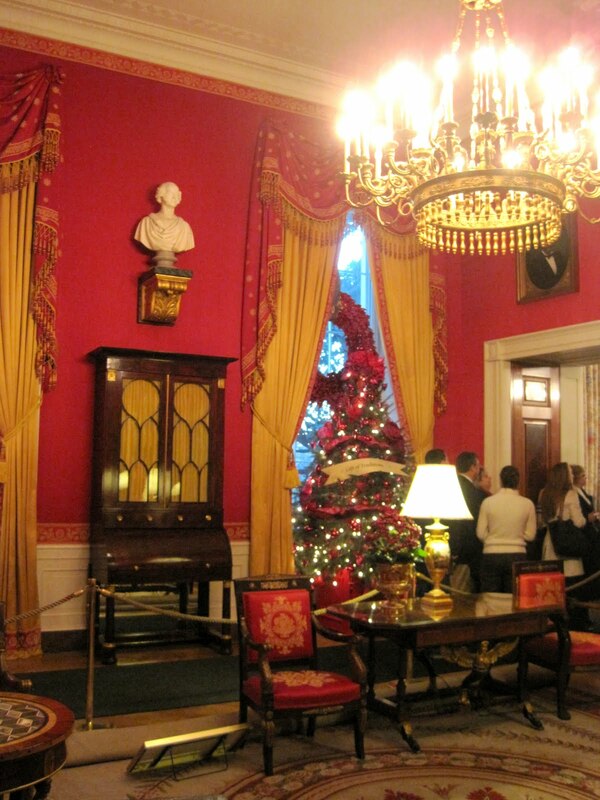 The walls are painted paneling from timbers which, before the Truman renovation of the White House, were the structure of the building (replaced by steel). 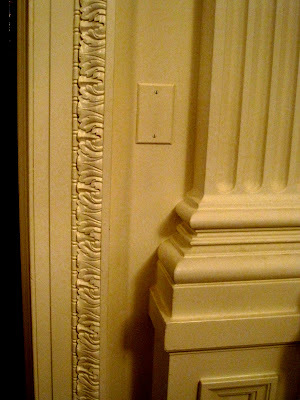 This paneling is seen in a number of rooms on the ground floor. 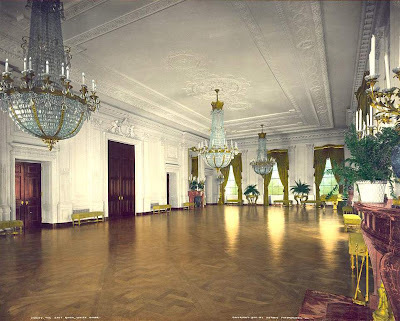 The paneling remained unpainted until the Boudin redecoration of the White House, seen above in 1963. I love that blue painted ceiling! 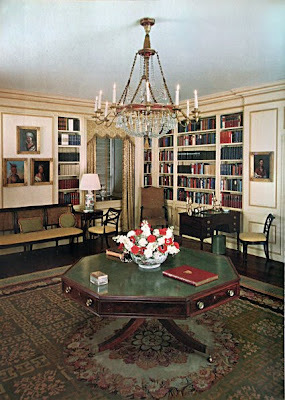 The walls of the Vermeil Room above (so called after the collection of Vermeil displayed here, donated by Margaret Thompson Biddle in 1956) are currently the same green painted paneling as in the library but here house portraits of First Ladies. The room functions as a ladies sitting room and is where the First Lady often receives her official guests. 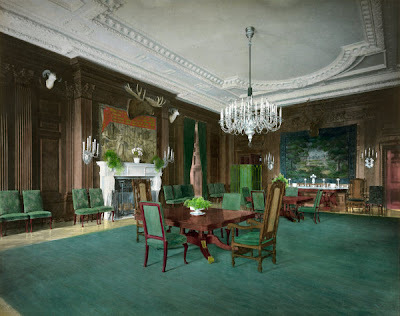 After the 1902 renovation, architect McKim created this room as a ladies lounge as it was adjacent to the ladies restroom and it has retained that purpose. 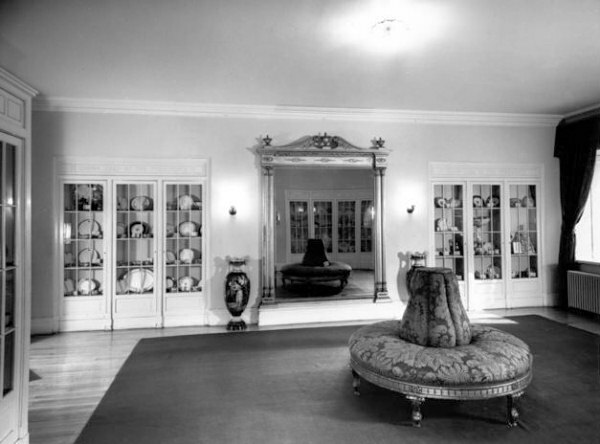 Above you can see the unpainted paneling in 1960. The walls were painted blue by Boudin's redecoration with a grained finish. 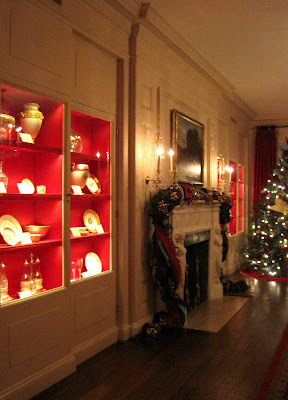 Originally, these ground floor rooms were staff quarters and the vermeil room was, fittingly, the silver polishing room! The carpet in the room is beautiful, an 1860 Turkish Hereke. Only a few rooms left to go -join me tomorrow to see the ground floor dining room! To those of you who celebrate, Merry Christmas! 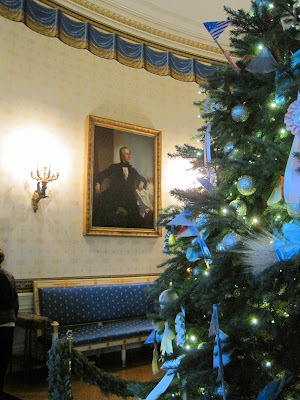 I hope you are all enjoying my White House tour, I know I am. Thank you so much for your informative comments. I have to admit I sadly know very little about this important building's history and am enjoying the lesson! 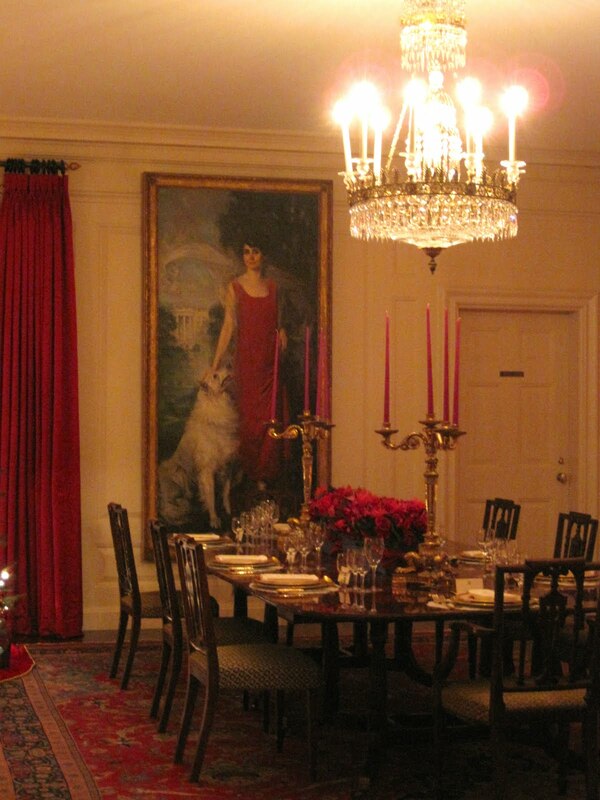 The State Dining Room owes its existence to the work done by McKim, Meade and White in 1902. Prior to this time, the room was half the size. 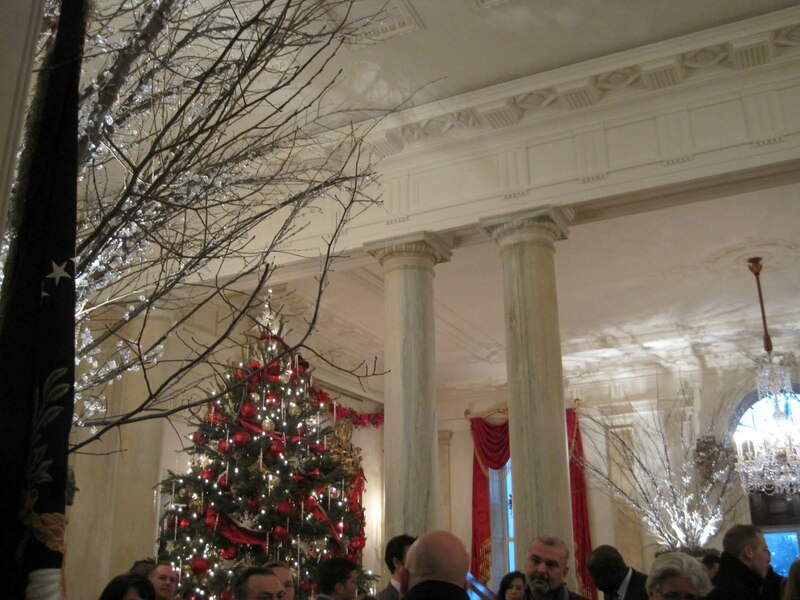 When the main staircase was moved to its present location, the dining room was able to be doubled in size and now can seat up to a presidential 140 guests. Oddly enough, this room from the 1902 renovation is the most original to the house since the woodwork survived the 1950 gut remodel mostly intact. 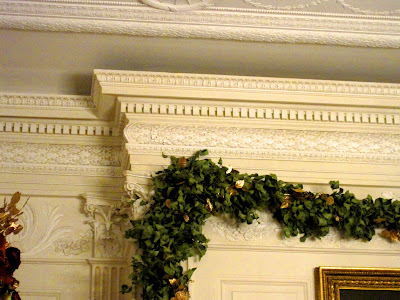 However, it did need to be patched and so the woodwork was painted a mint green. Below you can see the room with its original unpainted wood finish from 1904. As with the East Room, Boudin created a more elegant room by painting the walls in ivory. 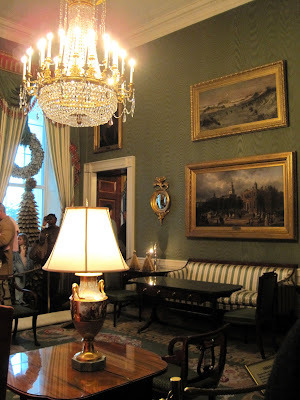 He also had the original silver plated chandelier and sconces gilded. 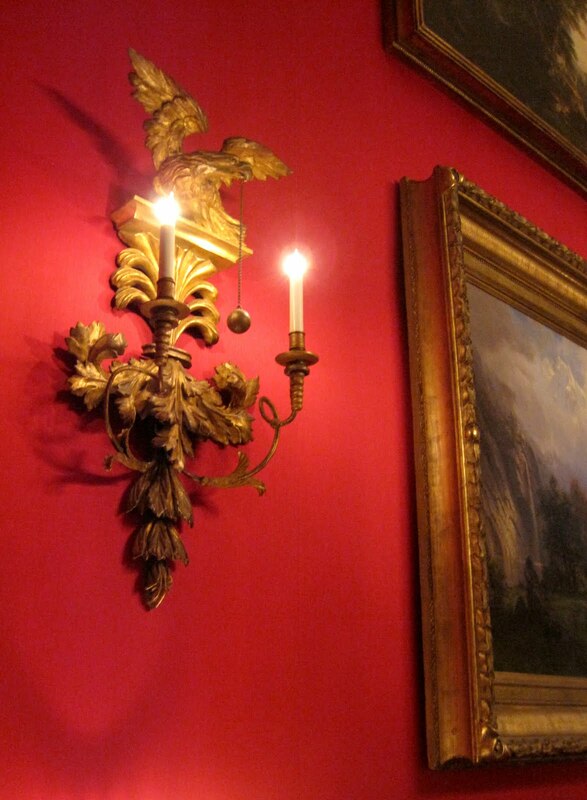 The sconces were moved from their original location, mounted on the pilasters, to the walls in between; a much more appropriate location (what was McKim thinking?). 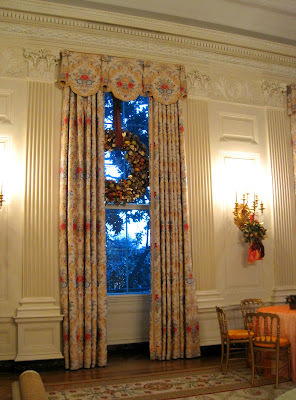 The current draperies date from the Clinton administration, as chosen by their designer Kaki Hockersmith. 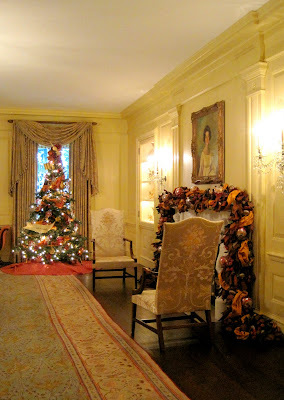 The fabric is colonial revival and the walls were painted a warmer stone color, while the ceiling was painted a complex white to more closely match the McKim unpainted plaster finish. One poor decision I think was that the gilded chandeliers were given a shiny finish, which to me makes them appear like brass. 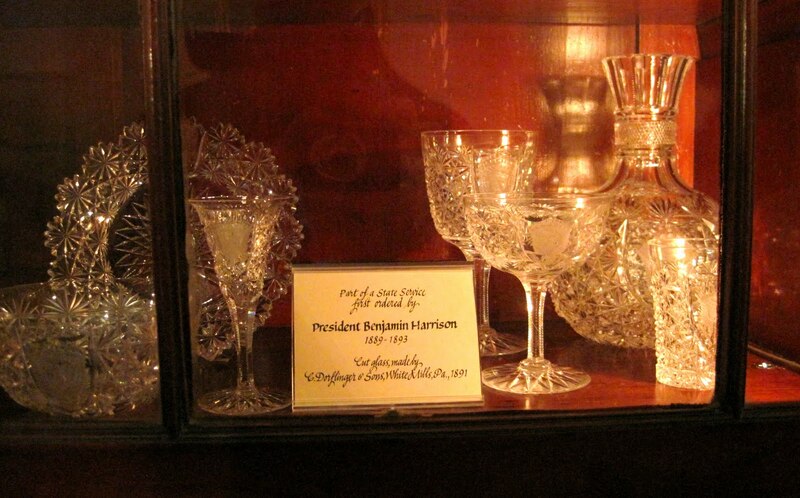 I think I would prefer the original silverplate, don't you? Here is a detail shot of the fine wood paneling by McKim. 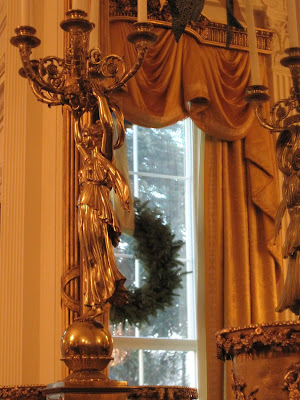 The console tables with eagle bases had been painted and gilded during Boudin's renovation of the room (ivory, to blend in with the walls), but the Clinton's had them returned to their original mahogany finish. 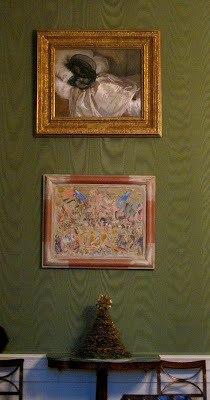 Above the fireplace is the Lincoln portrait by George Healy which Boudin had restored and it has remained since. Join me next week as I continue the tour! 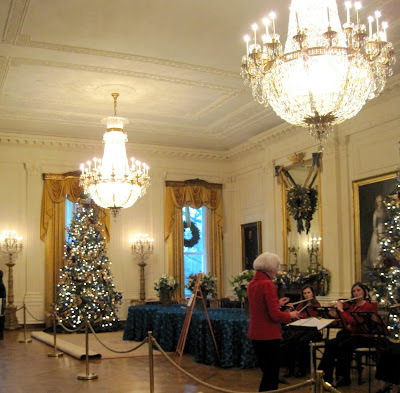 Probably the most famous room in the White House (at least in my understanding) is the East Room, home to some of the most memorable events in the building's history. 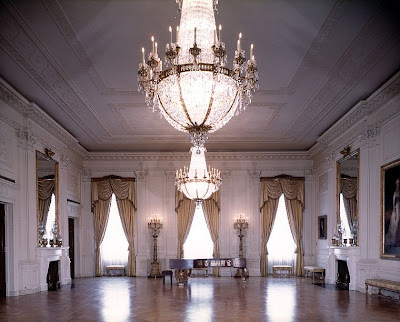 The largest room in the house, it was originally refered to as the Public Audience Hall but the name was thought to sound too reminicent of a throne room and so has since been referred to as the more democratic sounding East Room. 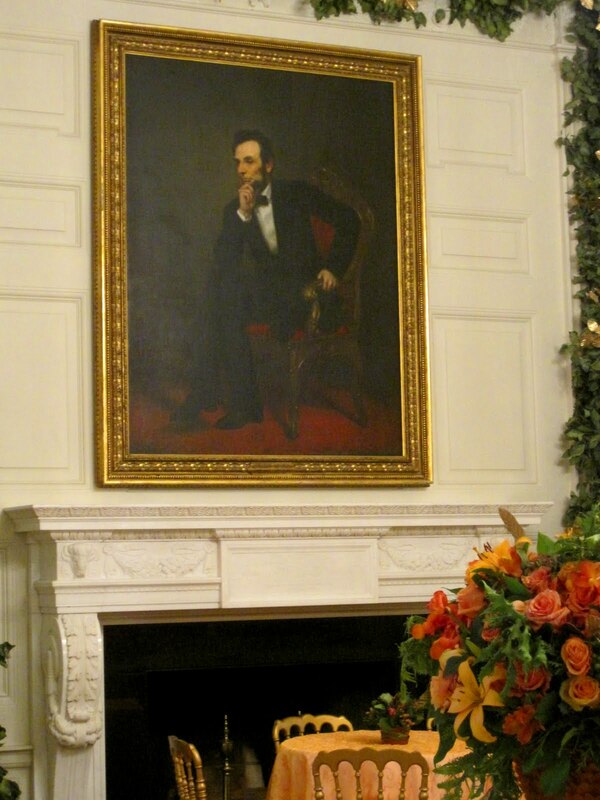 The room has changed notably from the 19th century. During Grants administration, the room was highly ridiculed as being 'steamboat Gothic', as seen below in 1873. Thanks heavens curators haven't decided to go back to this version of the room! 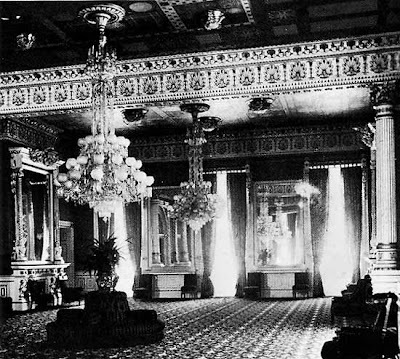 The room's transformation was done most notably by the architectural firm McKim, Meade and White, seen here below in 1904. 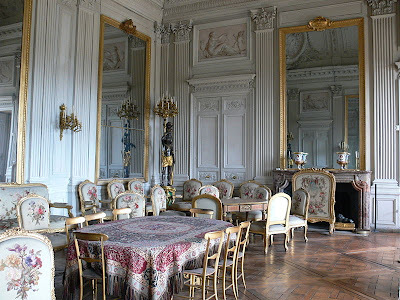 McKim based the Louis XVI design on the famous Salon de famille at the Chateau de Compiegne, seen below. 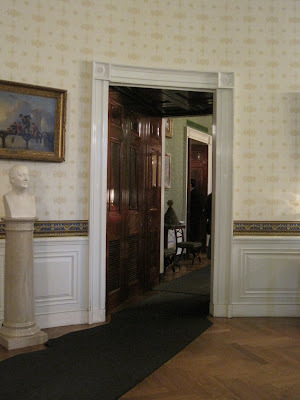 The details were perhaps slightly less refined due to the limited headroom, but notice the same heirarchy of pilasters and paneled chair rail: a notable inspiration. 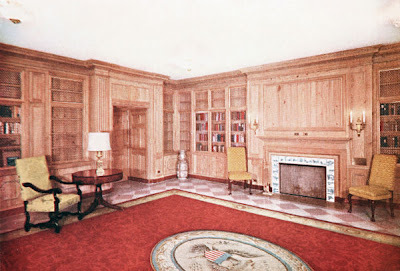 Later, from 1949-1952, when the room was dismanteled during the remodeling of the white house, the original paneling was damaged and had to be recreated. The picture below shows a detail of the paneling today (ignore the switchplate cover which I thought was a bit hilarious -thats the best they can do?!). The paneling was done in a simpler fashion but is perhaps more elegant to my eye. Certainly, at the least the ceiling is preferable if not the paneling. 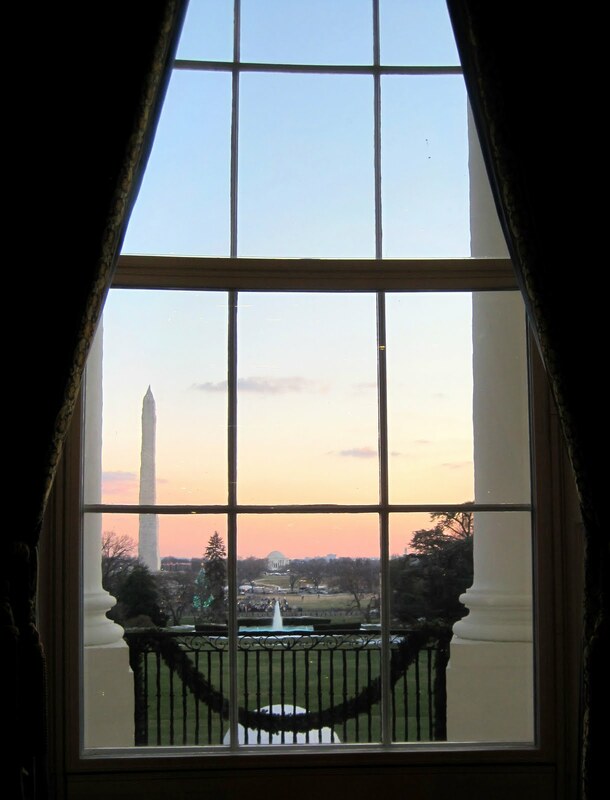 During the Kennedy administration, Jacqueline Kennedy made her famous bid to save the quality and history of the White House. She hired notable interior designer Stephane Boudin who oversaw a lot of the elegant transformation of the interiors including painting the red marble fireplaces a clean white, seen above (which I wish would be brought back into the room; the Clinton's had the white paint removed). 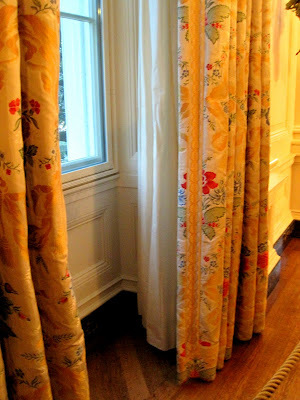 The curtains are of similar fabric to what Boudin chose although with a more complicated valance, done by Mrs. Bush. 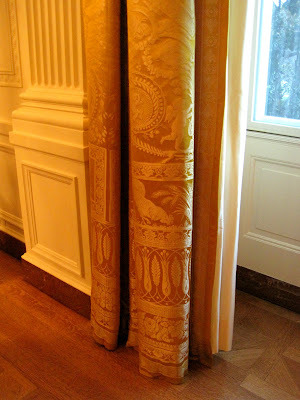 The gilded valances are original to the McKim renovation of the room. 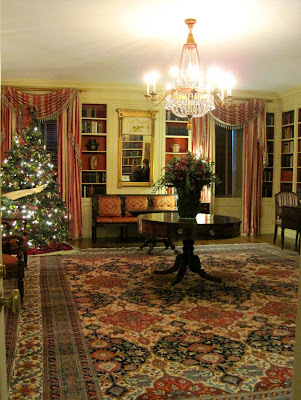 The Aubusson styled carpets were installed by the Clintons to help preserve the wood floors. 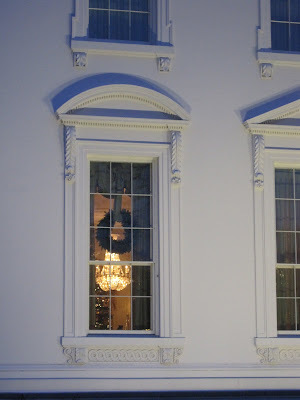 During the holidays, the central window curtains are opened to display a Creche. 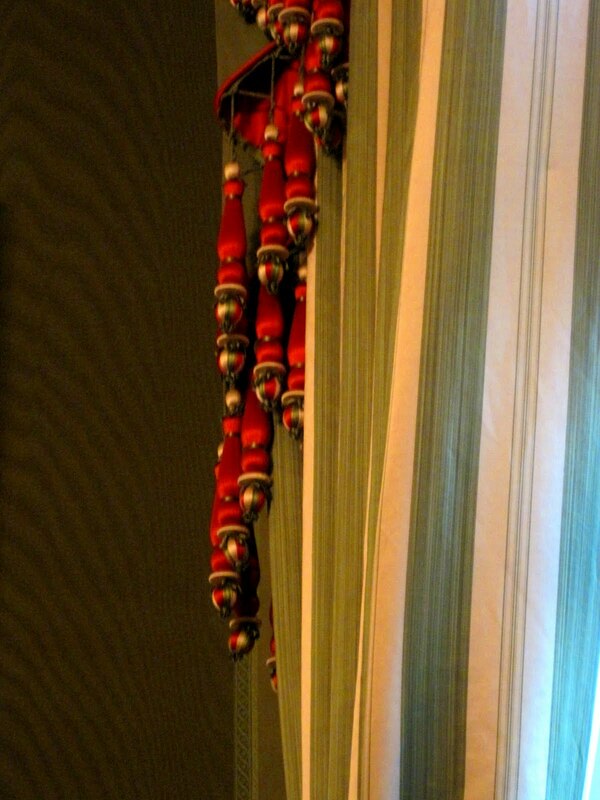 In most images I've ever seen, these curtains have been closed for whatever reason -is it the view? In this image from 1920 below, you can see a different window configuration from the McKim renovation which I prefer. I suppose during the Truman administration, when the room was changed and simplified, only the central window made the cut? 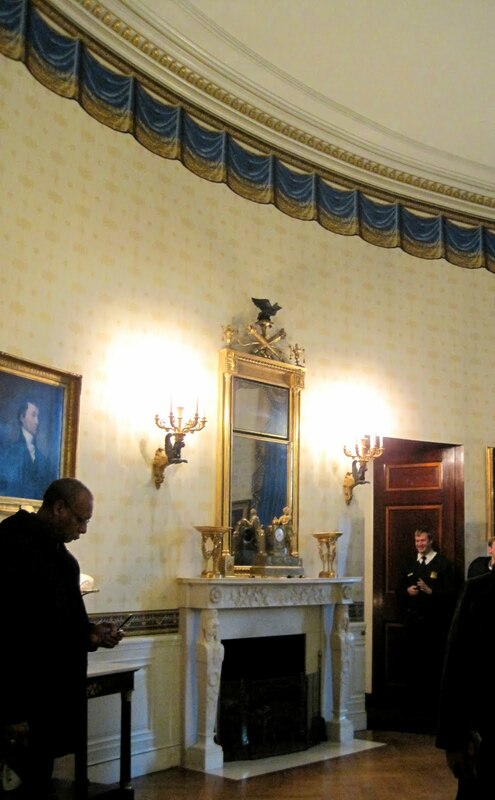 The beautiful mahogany doors and doorframes, seen below, are original to the room from 1815 when the room was first finished after the burning of the White House. Prior to that it was partitioned into spaces as needed, including Abigail Adams hanging her laundry here! 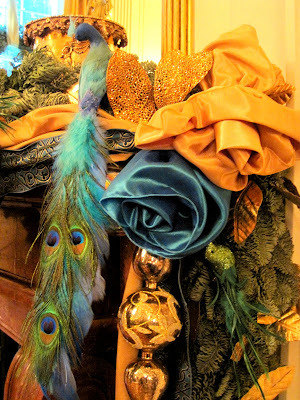 The theme in this years decoration is the peacock, which I think is a lovely color combination with the gold. 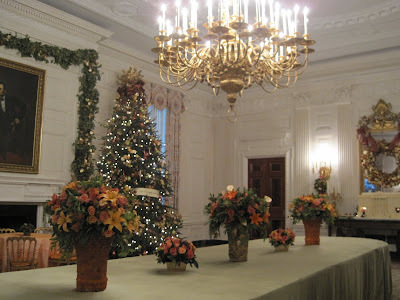 Join me tomorrow to see the State Dining Room. 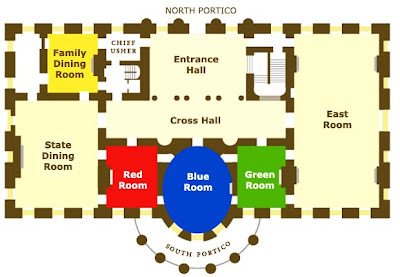 Directly across the Entry and Cross Hall from the front door is a series of parlors named after their color schemes;The Green, Blue and Red rooms. 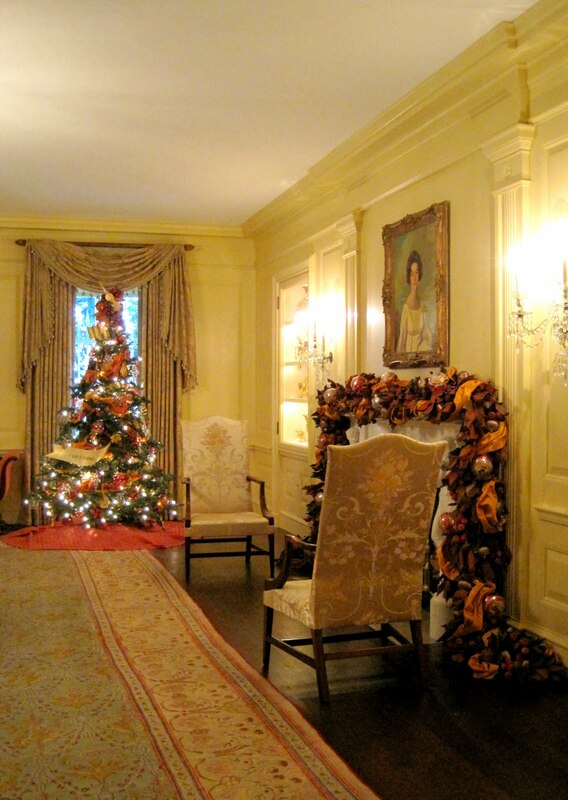 These rooms have held a variety of functions over the years but are all currently decorated in an empire style (early 19th century). 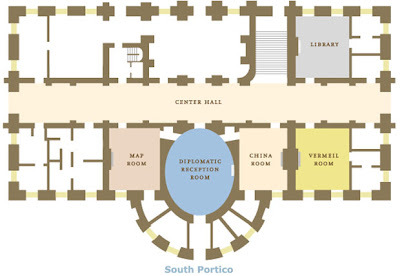 I suppose they have been the most popular entertaining rooms of the white house for their proximity to the entry, their access to the south portico as well as their intimate scale. 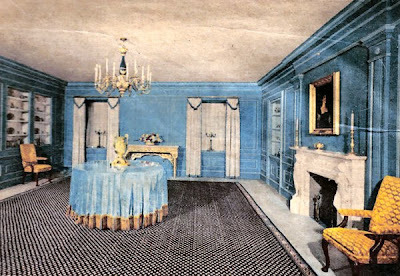 The blue room serves as a reception area and is the most formal of the 3 spaces based on the shape of the room, an oval. 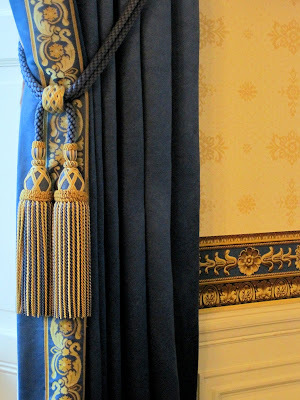 The color comes from the wallpaper border, sumptuous curtains and upholstery. 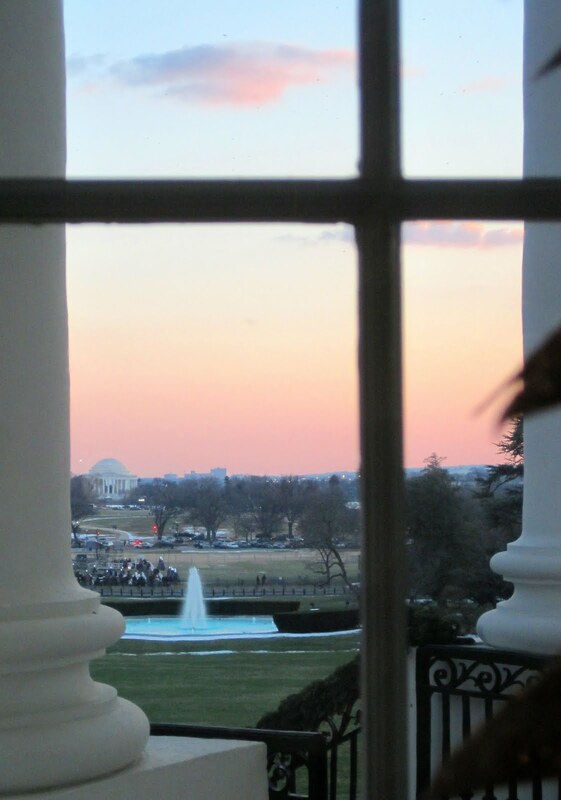 The view from this room is stunning, right on axis with the crescent fountain with views of the Washington Monument and Jefferson Memorial beyond. 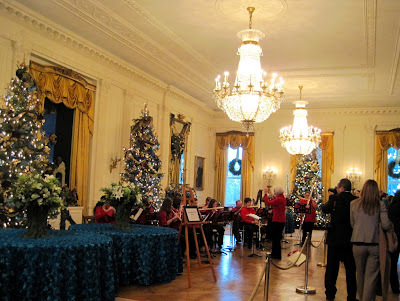 The tree in the center of the room is the official tree of the white house (each room seems to have at least one!) and represents the simple gifts of our nation from coast to coast. The Blue room has been home to the official White House Christmas tree since First Lady Jacqueline Kennedy switched locations from the more formal East Room. 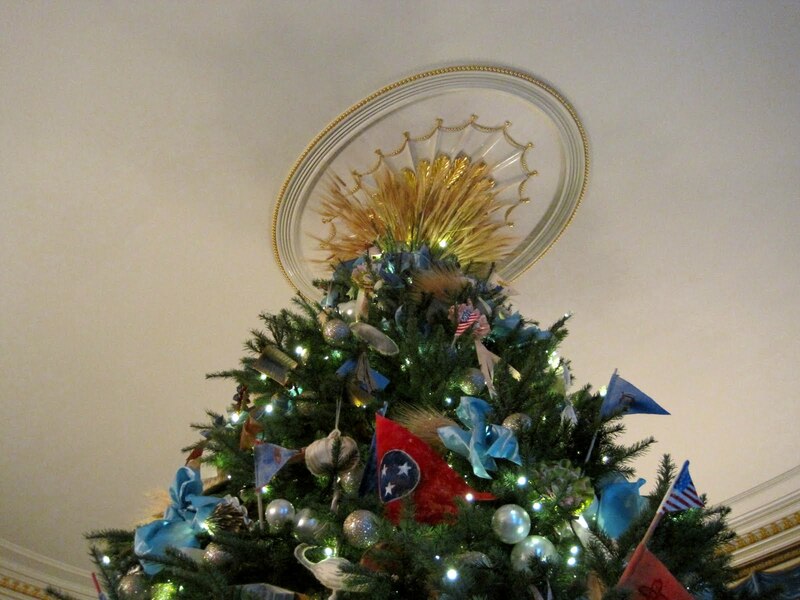 The 19.5' tall tree scrapes the ceiling and is crowned with a shaft of wheat. A friend had asked me how the plan dealt with the odd corners the oval rooms created (which the available drawings don't really make clear). They are used for storage behind these beautiful wooden doors along short vestibules. 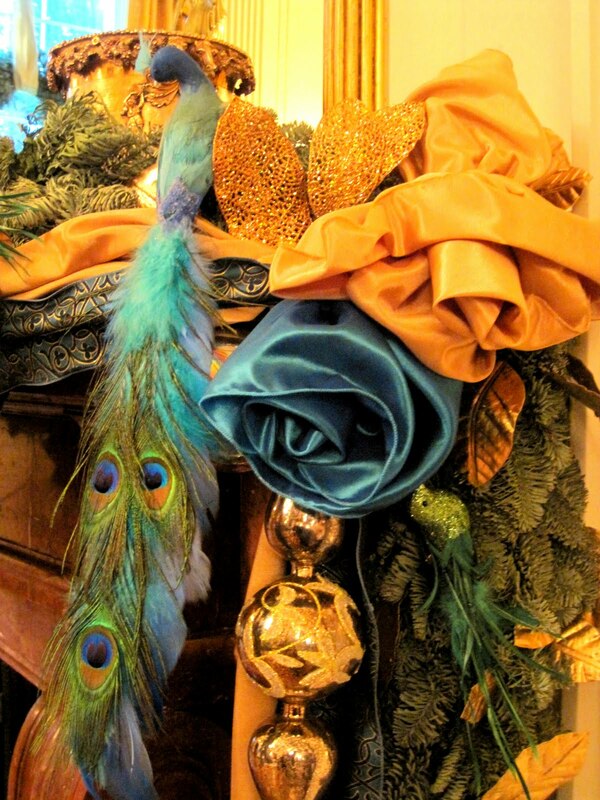 The Green Room (which reminded me more than any other room of an old folks home lounge, I had to say it....) was used to celebrate preserving and cherishing the gifts of nature (fitting: green). 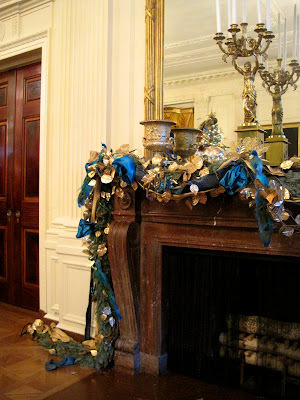 Therefore the decorations were all of recyled magazines and newspapers. 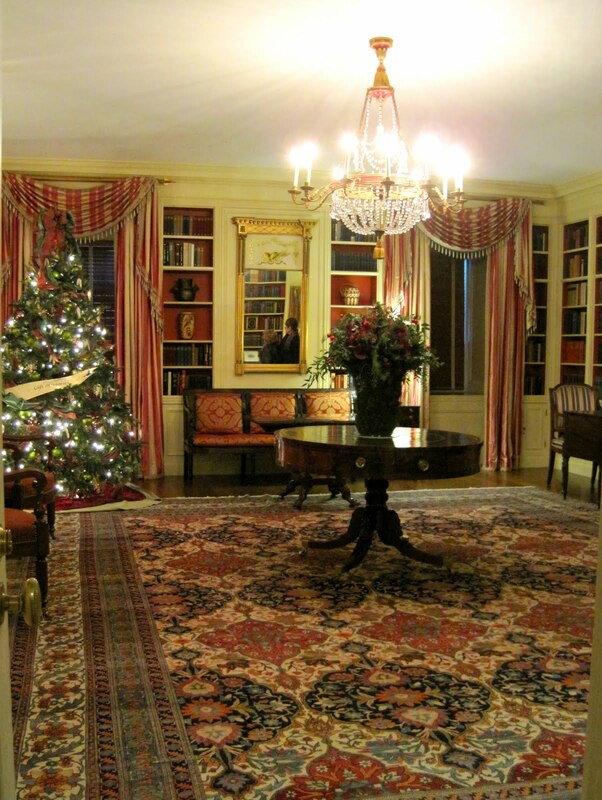 This was a favorite room of Thomas Jefferson and he used it as his dining room. 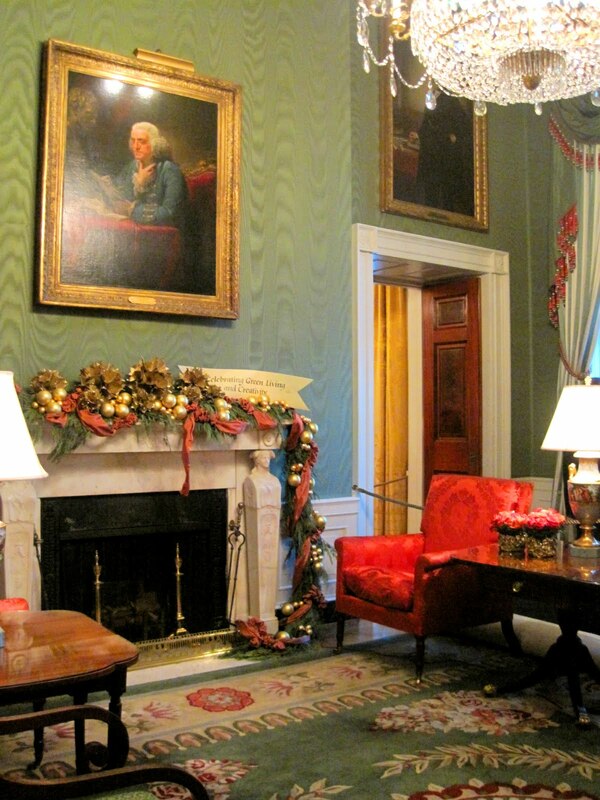 However, James Madison had it repurposed as a parlor which it has functioned as ever since. 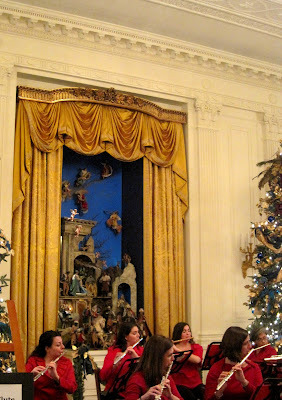 The art in this room was some of my favorite. I was stunned to see this John Singer Sargent painting. Fittingly, there is a marvelous view of the Jefferson memorial from his dining room. 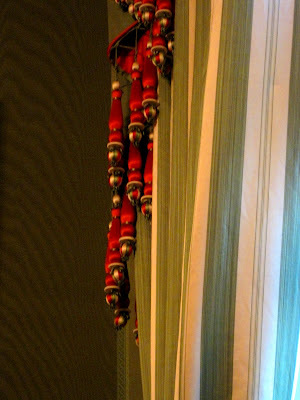 The curtains had this detail on them -what are these red tassel-like things called? 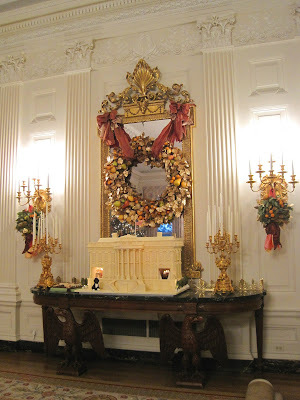 Did they ever serve a purpose or are they purely decorative; Who knows? I'll call them bobbins. 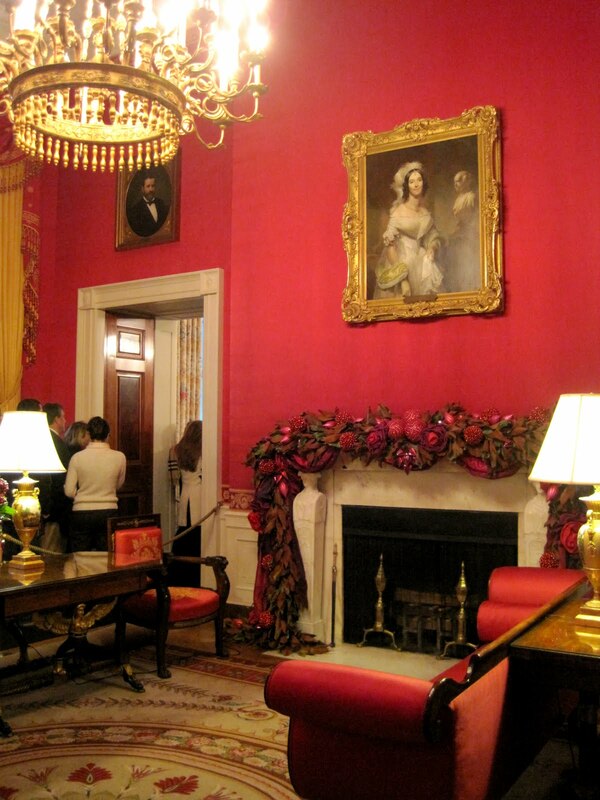 The Red Room is the parlor which first ladies typically use to receive their guests. It is also where President Hayes was sworn in (1877). The New York made American Empire styled furniture dates from the 1820s while the fireplace was installed in 1819. I loved these gilt metal sconces against the dramatic red walls. Join me tomorrow as we continue the tour!